I spent this long weekend out-of-town in a large, cozy, non-New York apartment (read: big kitchen). Instead of venturing out into the cold, we stayed in making shrimp and grits for dinner and chocolate peanut butter cookies for dessert. While I adore nothing more than cooking next to someone, coordinating movements, taste testing, agreeing on seasoning; the beginning, pouring over the cookbook, looking at pictures, reading aloud ingredients– I love that part almost more. 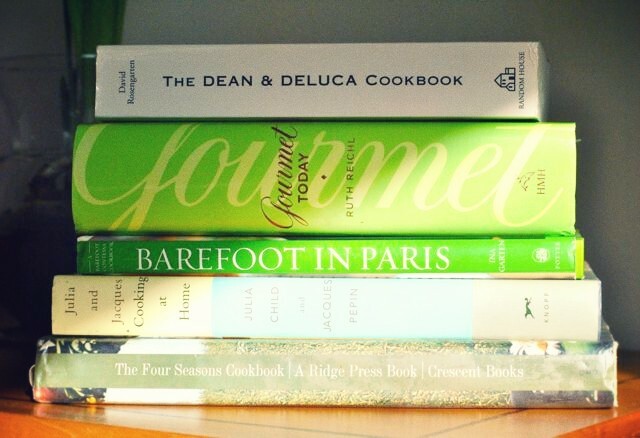 My current collection includes, from top to bottom, The Dean & DeLuca cookbook, Gourmet Today, Barefoot in Paris, Julia and Jacques Cooking at Home and The Four Seasons Cookbook. This entry was posted in Cooking and tagged Barefoot in Paris, Gourmet today, Julia and Jacques Cooking at Home, The Dean & DeLuca cookbook, The Four Seasons Cookbook. Bookmark the permalink. Yummy! I love to cook good food and eat desert! Reading and planning the meal is my favorite part too! I love (though it is super wordy) the Zuni Cafe Cookbook and the Chez Panisse Vegetables Cookbook because the recipes are always so fresh tasting and creative. I’m having a serious craving for the Zuni bread salad with pine nuts.